Maggie Georgopoulos is an author, speaker, and executive coach specialising in helping female talent reach their full potential. She is a degree qualified Mechanical Engineer who rose to become the executive chairman of a large agricultural company in Australia by the age of 32 (and the only female on the board at the time). She has experience in a wide range of industries, largely those with a reputation for being male-dominated: manufacturing, automotive, oil and gas, and agriculture. Maggie is widely traveled, with her business taking her around the world, including the Middle East, West Africa, Southeast Asia, and Europe. Her diverse cultural experience, coupled with her experiences working and holding leadership roles in male-dominated fields have given her a firsthand insight into the challenges,blocks, and frustrations that women can face while trying to obtain leadership success. Maggie shares her own experiences—the good, the bad, and the ugly—as well as those of other leading Women Business Executives and Entrepreneurs, in a down to earth and insightful style that is easy to relate to regardless of your current occupation. Maggie began her career as an apprentice electrician with mining giant BHP in Australia. She discovered very early in her career that she liked heavy machinery and soon decided that her skills would be bette rsuited as a Mechanical Engineer. She was then confronted not only with the prejudice of being a female ina male-dominated field (she was one of only two females in her graduating class), but also and surprisingly,the prejudice of other women who held assumptions on what she should prefer to do with her career. Maggie moved from one role to another, often being the first to step into newly created roles. This prompted her to create supportive networks for guidance from both inside and outside the industry. Maggie strongly believes that everyone is born with the ability to succeed and she is passionate about getting in there and helping others achieve their dreams. She has worked with Maasai women, assisting them in setting up micro businesses to generate the funds needed to clothe their children and send them to school. She has mentored women around the globe to help them climb the corporate ladder, and has worked with young people to empower them to step out of the poverty cycle they were born into. Maggie is passionate about her work and is a great leader and motivator in her field and her community. All of this hinges on Maggie’s lifelong philosophy: she deeply believes that obstacles are only challenges to help us grow, not to stop us. Are you worried that as a woman, you lack full control over your career, or struggle with whom to turn to for support in your leadership journey? You may feel forced to make compromising life choices to advance your career—ones that your male counterparts do not. Women can thrive in business and reach the top of the leadership ladder, though it often doesn’t appear that way, as few seem to make it there. Today’s business climate is filled with opportunities for women to climb just as high and be just as successful, though recognising these opportunities can be challenging. Women can thrive in male dominated fields and can help to make businesses even more successful with their own brand of leadership. 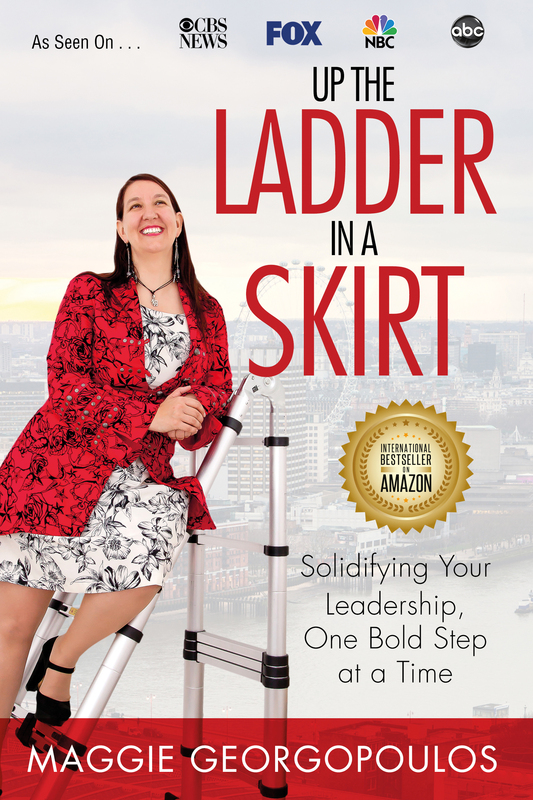 If you are searching for help along the leadership path, Maggie Georgopoulos’ Up the Ladder in a Skirt is the perfect guide. Whether you are male or female or where you are on your leadership journey, you will benefit from the practical tips and insights shared by Maggie and other successful women business leaders and entrepreneurs. As a speaker and coach, Maggie has built her reputation helping women all over the world to develop their own personal leadership qualities. She helps women discover and clarify their personal leadership goals, assisting in climbing further up the leadership ladder. The tips and suggestions inside will help you develop your productivity and that of your team through implementing better leadership qualities. Develop key business strategies and build successful teams around you. Up the Ladder in a Skirt is the first hand experience of climbing the corporate ladder as a female in male-dominated fields. It serves as a handbook for both men and women, describing how to be a part of the solution: Creating culture change within organisations to bring balance to the leadership equation. Learn step-by-step strategies for climbing the leadership ladder. Use personal skills and strengths in your leadership climb. Create a stronger voice in the leadership community. Gain leadership success as a woman in a ‘man’s world. Discover how to conquer the voices telling you you’re ‘not good enough’. Learn to use a true sense of community to climb the ladder. Whose ladder are you climbing anyway? Learn to make it yours. Discover different ways to climb the leadership ladder, and how to smoothly swap from one ladder to another. Define authentic success on your own terms. Explore personal peace of mind and positive health as you venture forward. “Look around you in the world of politics, business, even sport, and you’ll see proof that Women are not on the rise, they have already risen. Almost unnoticed, they have been fulfilling their potential and stepping into their power for more than a decade. Through this book, Maggie Georgopoulos shares how this quiet revolution has been achieved, and how success in any walk of life, is not some special gift for the few, or just the domain of men, but an achievable goal for anyone with passion, and determination to climb their own personal ladder.